I have been going a million miles and hour and I cannot remember if I wrote you back on my phone :-). If I did, this is just to reiterate what a great job you all did. If I have not written you then .... Thank you SO much! You guys were fantastic. The music was a perfect fit for our theme. Until next time. Thank you so much for your involvement and making our evening special. When we set out looking for a band, your demo tapes helped to make our decision. At our event, you far exceeded the demo tapes. The sound, selection of songs, professionalism and involvement in our event was commented on by most every guest. Again, thank you very much, and hope to see you at our next party! Thank you! It was perfect, exactly what the bride and groom envisioned. All of our guests loved the music and thought it was a wonderful touch to the ceremony and cocktail hour. Russ played beautifully. 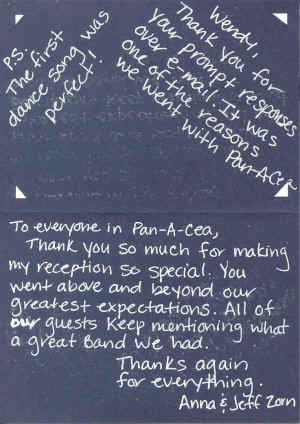 We will recommend Pan-A-Cea to anyone we know that would like a steel drum or calypso band. Thank you so much for playing at our wedding yesterday! You were the hit of the party! All of the guests were raving about how great you were! It really was the perfect touch for our big day! Our first dance song and father/daughter dance were perfect! I could not have asked for anything better!! Thanks again for everything! I wanted to thank you for the amazing music you provided for our Calypso Street Party on June 16th. I have received so many compliments about the fantastic music and everyone has told me they had a great evening. This party was a departure from the events we generally have and it was fun and exciting to try something new. Thank you once again for helping to make our party the success that it was and,hopefully, we can do it again some time. Thank you for making my "50th" birthday my DREAM PARTY!!!!!!! Everyone absolutely loved you and especially myself. I am sure you could not tell by my non-stop movement to my favorite dance music! Loved the music; very easy to listen to and liven up a party. Many of our party guests were very pleased and asked us where we "found" the musicians. Really added to the theme of the tropical evening! I wanted to say thank you so much for the amazing job you did at our wedding on Saturday. 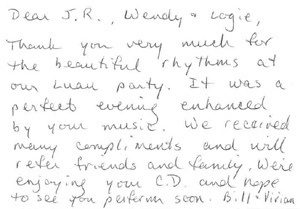 Many of our guests made a point to tell me how great they thought the music was! Thank you for making our day so special! If you need any referrals or references from me, let me know. I'd be happy to sing your praises! Just wanted to take a minute to thank you guys for your wonderful performance at our reception. We very much appreciated your flexibility with song selection and your willingness to share the stage with another performer. People are still talking about how great you were. Your music was the key ingredient in creating the reception we wanted. You guys sounded incredible and we saw people dance that we had never seen dance before! The coordinators at the Catalina Room were also very impressed and we hope that that turns into future business for you. Pan-A-Cea perform again in the future. I can't begin to tell you how wonderful you guys were last night! I got so many compliments and kudos at this morning's meetings on just how great the music was, and how much fun the evening was because of the band. I was SO proud!! Please accept our (BMW of North America's Western Region) thanks, and pass on the same to Elizabeth and Gerald, both of whom are also extraordinary musicians...and people!!! I wanted to personally thank you for the fabulous job you did at Inger & Larry�s wedding. We missed the cocktail hour, but we have heard nothing but rave reviews on your performance. Thank you for making this an extra special day for Inger & Larry. Just wanted to tell you that the guys did a GREAT job. Everyone loved them. They were on time (early actually), professional, fun and we loved them. Thanks for your help in setting everything up. We will definitely use them again and I gave their info to several people who asked. You made our wedding perfect with your music. Everyone loved it! We felt like we were in the Caribbean and the Buffet music was awsome! Thank you Wendy for the wonderful entertainment last night. We really enjoyed ourselves and everyone spoke highly of your music. Thank you again. Hope to use you again in the future! Alas, this is not a request just now for a booking, but an expression of thanks for the enjoyment the band provided yesterday at Descanso Gardens. It was a lovely setting in which to hear the very enjoyable music. We'll remember you when and if we plan a private gathering. Meanwhile, please pass along our thanks and regards to Mr. Crawford and your other fellow musician (his name escapes me). It was a memorable afternoon. I never got around to thanking you for the perfect arrangements for my 50th party here in Westlake Village on June 16th. The band was great and it contributed to a fabulous evening for me. I hope that it will lead to more bookings for you guys. Thank you once again for your participation in our Juneteenth Celebration program on yesterday. Everyone really enjoyed you. I know our sound tech (James Taylor) touched base with you in order to inquire about hiring you for a private party. He actually works as a sound tech for Stevie Wonder. The pastor of our church was in attendance also and he really enjoyed your music as well. He expressed interest in hiring you also for a private engagement in the future. Thank you so much for the wonderful job you did at my wedding cocktail hour on May 17. We received many compliments on our choice of entertainment! Your band started off our reception on a fun and festive note, which is exactly what we wanted. We really appreciate your talent and creativity! Just a note to thank you very much for making our wedding reception on the 8th so much fun. We just returned from our trip up north and everyone is still talking about you and the great Jimmy Buffet sounds. You two are fabulous. Everyone said it was the best party they had been to in years. My boss' wife, Kathy K, is planning a fish fry/BBQ on Sunday, Sept. 14th. I've given her your card and asked her to call you. If you ever need a reference, please do not hesitate to give them my name and phone number, I'll be singing your praises. We enjoyed the show. I have given your name to an associate of mine (Mark Carter, Catering) who may be contacting you for a gig in a couple of weeks. If we have the need for the band at any of the events we plan and produce we will certainly give you a call. I just wanted to say you both did a fabulous job at our wedding! People are still talking about how great you sounded. Thanks again! And for learning "Kiss the Girl" so well! Just wanted to drop you a line to thank you and J.R. for the incredible job you did playing at my party. Everyone loved the music! You two were a major contributor to the success of the afternoon. You were "hot hot hot!!!" We all had a blast and I just wanted to take minute to thank you. I hope that I have the opportunity to hire both of you in the future. Blessings & Peace, Diane MacDonald, Manager, Seminar Dept. I just wanted to take a minute and Thank you for the Aweome job you did playing at our wedding June 14th. I am still upset because the pictures took too long and I wasn't able to enjoy the music for the cocktail hour. Everyone said you were great. When you started to play as we walked back down the aisle I was filled with so much happiness I just wanted you to play forever. I couldn't have asked for a more perfect day. Thank you so much for being a part of it. Do you ever play around the area where we could come and check it out? I would really love to be able to hear you again. let me know!